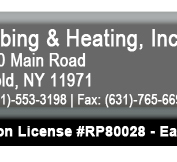 We are the East End's most reliable full service plumbing & heating company working on both the North & South Forks of beautiful Long Island. Southold Plumbing & Heating is a company you can feel confident with and trust whether you are building your custom dream home in the Hamptons, renovating the family cottage in a quaint village on the North Fork or upgrading your existing home. "We specialize in all your plumbing and heating needs from drips to disasters and from renovations to new construction! Our plumbing and heating mechanics are NOT "salesmen" and do not work on commission! If you need it, we will advise you and take you through it. If it can be repaired we will be sure to fix it!" We are local & most importantly reliable. Our reputation is measured on the quality of service we provide YOU our neighbors!